"Colorado Law’s experiential learning and public service programs afford students the opportunity to hone their legal research and writing and oral advocacy skills. Students often secure their first post-law school job as a result of contacts they made while completing an externship with a judge or at a nonprofit organization, and students who compete in external mock trial and moot court competitions have the chance to showcase their written and oral advocacy skills in front of lawyers and judges from around the country." The case method and teaching by Socratic dialogue have been around for 160 years. Colorado Law still uses them effectively to teach critical analysis—thinking like a lawyer. However, the greatest change in legal education has been the introduction of multiple opportunities for practical experience. Experiential education includes lawyering activities outside the classroom—clinics, externships, appellate and trial competitions, and voluntary public service work—as well as experientially-oriented classroom learning. The Experiential Learning Program gives coherence to our entire curriculum and fulfills the school’s mission of providing a well-rounded learning experience. It builds linkages between experiential education and in traditional classroom teaching. 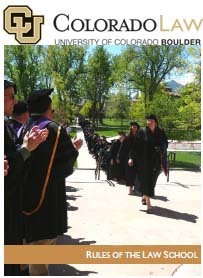 Colorado Law’s Clinical Education Program started in 1948 and now serves 700 clients each year. Clinics provide practical learning experiences for our students, much-needed assistance to those less fortunate in our community, and invaluable service to the public good. Externships, field placements for academic credit, involve substantive legal work at a government agency or non-profit organization. Students may work in all three branches of the government, at all three levels of government, including state and federal judicial chambers, executive agencies, and congressional offices. Students may also extern with nonprofit organizations. Students develop professional lawyering skills, gain insight into various aspects of the legal system and profession, and cultivate a sense of professional responsibility. Law students compete in appellate, trial level, and transactional competitions to develop skills in appellate brief writing and oral argument, trial training, and transactional drafting /negotiations. Colorado Law teams have consistently been extremely competitive and the law school participates in and hosts more competitions each year. Selection of teams varies by competition and is overseen by the various sections of the Barristers' Council. In this voluntary Public Service Pledge Program, Colorado Law students pledge to volunteer a minimum of 50 hours of law-related service during their time at the school. For students who complete at minimum of 50 hours, their public service is recognized on their transcript. Faculty can help connect law students with organizations and lawyers who need pro bono assistance. In addition, there are several faculty-led projects for students to volunteer to work with each semester.